On Feb 16, 2018 Ken became the Cantor at Jericho Jewish Center on Long Island, New York, bringing to a poignant close a fruitful chapter of thirty-one years in the history of Hawaii’s Jewish community and in Ken’s own life. Ken came to the University of Hawaii in 1987 on a Pacific Asian Fellowship in Ethnomusicology. He brought with him a degree in Music from U.C Santa Cruz with a specialty in Baroque performance. He brought experience in directing and teaching folk music, in choir, instrumental, and theater production. He also brought with him, still nascent, a lifelong love of Jewish music and chant. 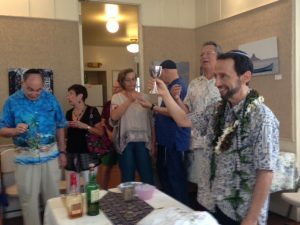 While studying at University of Hawaii, Ken discovered that the local Jewish community had sent down roots and was slowly growing in self-awareness. He began to participate – and found that he was welcome and needed. He responded to that need with increasing eagerness, traveling to outer islands, serving in unaffiliated chavurot. Slowly he realized that he had found his true vocation – to become a cantor! He began to act on that goal, assisting in Temple Emanu-El services. Soon Rabbi Stephan Barack hired him as their first-ever year-round cantor. He studied with local teachers, Tuki Barzilay, Rabbi Morris Goldfarb, Gertrude Serata. He studied with visitors R. Arthur Lelyveld, Jonathan Webber. He also entertained at festivals and Israeli folk dances. He began participating in more and more aspects of Jewish communal life. And his wide performance skills were recognized! In 2001 the Hawaii State Foundation on Culture and the Arts honored him by awarding him the title of Master Folk Artist. Ken continued to study, to immerse himself in all aspects of Jewish music and chant, readying himself for chazzanut. He sought guidance from the The United Synagogue, and – huge success! In 2006 he was officially designated a Member of the Cantor’s Assembly. That designation allowed him to conduct High Holiday services for mainland congregations, to serve as music director at Camp Ramah . He has continued to travel back and forth these past 15 years. But his special relationship with our Jewish community was deepening. Locally funded and supported, Ken started the Hawaii Hazzan Project in 2007 which allowed him to bring his special skills and kavanah beyond Oahu to congregations on the outer islands. We at Sof Ma’arav will dearly miss Ken’s lyrical voice, his long participation in and support of our congregation, his signature surprises, his unexpected juxtaposition of Sephardic and Ashkenazic melody. We will miss his freshening of familiar prayers with Hawaiian song! We will miss his encouragement of congregational response and his creative use of music throughout the service. We are most grateful to him! This is a sad leave-taking, but we send him forth with our love and heartfelt wishes for continued success. May new horizons open for him.